Evan Puissegur is eighteen years old now, just graduated and headed off to college at the University of Louisiana at Lafayette. Having endured a lifetime of surgeries, he’s matured into a confident young man and is happy to offer advice for families of children who like him were born with cleft lip and palate. 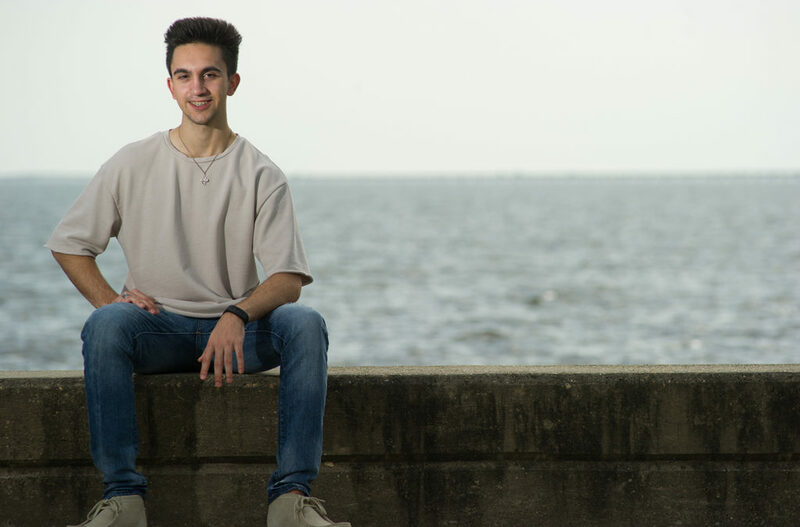 We met Evan and Kim at the Mandeville Lakefront on Lake Pontchartrain in Louisiana, and the photoshoot was a breeze. Evan is a natural in front of the camera, as it turns out. And his parents are justifiably proud of the man he’s become. Of course, this is the third set of braces Evan has had. As is common for families of children born with cleft lip and palate, his childhood was full of surgeries and doctors’ appointments. Each individual child’s course of treatment mirrors that particular child’s development, which in turn drives an individualized timeline. “Every day, I just tried to do my best at whatever I was doing,” Evan agrees. As for sports, children born with clefting issues can play sports without limitations, so long as they have the proper instruction and the necessary gear in order to protect his or her mouth (including special mouth guards – talk to your doctor about the proper equipment for your child’s chosen sport). These were the last two surgeries – major surgeries – final jaw surgery followed by cosmetic reconstruction of his nose. Evan stresses the importance of choosing an oral surgeon that made him feel confident and with whom he could communicate. Dr. Hugo St. Hilaire and his team use the most advanced technologies in planning, and in simulating Evan’s surgery it became clear that in order to heal, Evan’s mouth would have to be wired shut (for 32 days, as it turned out). For this reason, the surgery was scheduled for summer, so that he wouldn’t have to miss any school. Today, though, he’s happy to sit and/or strut in front of the camera. On his arm, we notice a tattoo: G>^V which means “God is Greater than the Highs and Lows,” and one gets the sense that his confidence is grounded in an unshakable faith. Ask him what he is looking forward to most, however, and he gives the response you’d expect from any young man. “I am just ready to get the braces off…” he says.